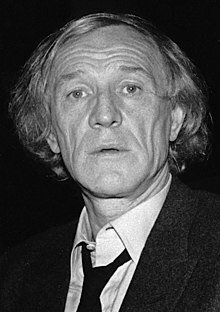 Richard St John Harris (1 October 1930 – 25 October 2002) was an Irish movie, stage, television actor, writer, movie, stage producer, singer-songwriter, and a movie director who is known for his roles as King Arthur in Camelot and as Albus Dumbledore in the first two Harry Potter Movie Series. He was lifelong friends with Irish actor Peter O'Toole. Harris was born in Limerick, Irish Free State on 1 October 1930 to an Irish Catholic family. Harris studied to become an actor at the Crescent College and at The Royal Academy of Music and Dramatic Art. Harris was married to Elizabeth Rees-Williams from 1957 until they divorced in 1969. Harris remarried in 1974 to Ann Turkel until they divorced in 1982. Harris has three sons: Jamie Harris, Jared Harris, and Damian Harris. Harris died on 25 October 2002 from Hodgkin's lymphoma in his London, England home, aged 72. He was replaced by also Irish actor Michael Gambon to play Dumbledore. ↑ Richard Harris. Find A Grave. Retrieved 23 October 2018. ↑ Severo, Richard (26 October 2002). "Richard Harris, Versatile And Volatile Star, 72, Dies". The New York Times. Retrieved 10 December 2007. This page was last changed on 23 October 2018, at 09:53.